Fly Fishing on the Mighty Savegre and Naranjo Rivers. Fish the lowland rivers of Costa Rica for a wide variety of species including snook, snapper, mojarra, grunts, and the hard fighting machaca. Fishing is done by drift boat and at times on foot in this serene and beautiful environment. 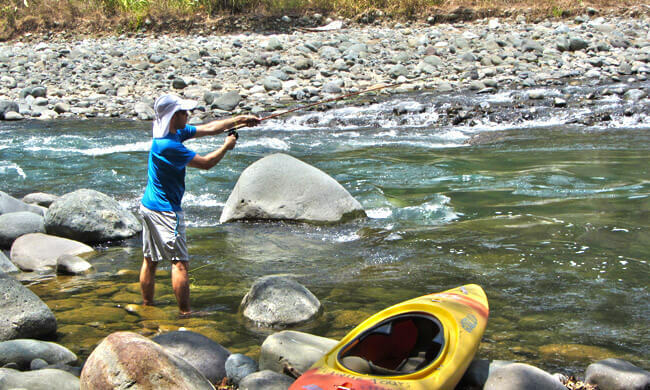 You will be guided down the river and be pointed out the top fishing holes. This is a FLY FISHING trip! Tour includes: Hotel pick up/drop off, beverages, tackle, bait, lunch. All guides are bilingual and have current Red Cross CPR and First Aid training. To bring: Polarized sunglasses, hat, sunscreen, quick-drying clothes, shoes or sandals that can get wet and provide traction on wet surfaces, camera.